On its 17th year, Vision Petron, the multi-awarded national student art competition of oil industry leader Petron Corporation, opened its Fuel Creativity Exhibit at the Bencab Museum in Baguio, last October 14, 2017. The month-long exhibit is a retrospective painting exhibition featuring selected works of Vision Petron National Student Art Competition grand prize winners over the years. Originally conceptualized as an art competition to inspire young artists from all over the country, Vision Petron has evolved to become a venue for expression, even on social issues such as the environment, and now includes photography, T-shirt design, video-making, and most recently, music. Vision Petron’s Fuel Creativity Exhibit showcases the best works of budding Filipino artists from the turn of the millennium, when the competition was first introduced, and reflects the changing themes that embody the best of Filipino values, culture, and heritage. Benedicto Cabrera, or Bencab as he is more popularly known, is a National Artist for the Visual Arts, and a staunch presence as a member of the Vision Petron board of judges. Himself a multi-awarded winner of many art competitions as a struggling young artist, Bencab serves as a role model for the thousands of talented Filipino youth who submit their entries in the various Vision Petron competition categories. For the 2017 Vision Petron competition, the theme was "Tuklas Kagalingan: Rediscovering Filipino Ingenuity." Entries focused on one of our unique strengths as a people, the ingenuity of the Filipino that captures the spirit of innovation and creativity, rooted in our natural resources. Judging was recently completed, and winners will be announced soon. Every year, Vision Petron wins recognitions, and now has over 150 awards. The Vision Petron Folio, a magazine for youth on Philippine art and culture, has been inducted into the Anvil Hall of Fame for consistently earning the Gold Anvil year after year. Vision Petron also recently bagged four International Association of Business Communications (IABC) awards, including two Awards of Excellence, at the 15th Philippine Quill Awards. The Vision Petron Fuel Creativity exhibit will run from October 14 to November 26, 2017, at the Indigo Gallery of the Bencab Museum on Km. 6 Asin Road, Tuba, Metro Baguio. For more information, please call (074) 442 7165 or email bencabartfoundation@gmail.com. 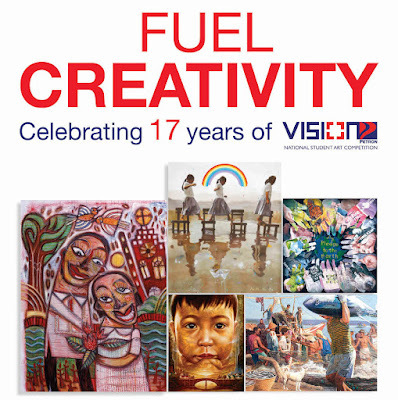 You may also visit www.visionpetron.com to know more about the national student art competition.